Mini Paintball is a low firepower introduction to paintball for 9-11 year olds that makes a great birthday party! If your group is desperate to play paintball but are just too young still, mini paintball will allow them to experience the thrill of paintball using the popular Splatmaster system. Our Splatmaster z200 shotguns are pump action and spring powered which means the paintballs leave the gun with not much more force than a nerf bullet. The paintballs themselves are also half the size of standard paintballs which means they have less mass and less impact force - (it hurts less). A mini paintball party will last 2 hours and starts with a safety brief and target practise before the teams undertake a series of games and challenges using their guns in races to hit various targets. The second half of the session will finish up with actual paintball game play where they move from shooting at targets to shooting at each other - what they've all been waiting for! 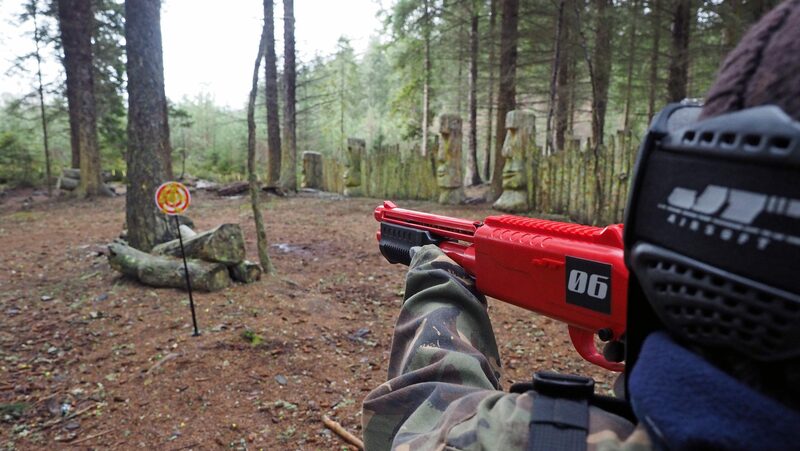 *Please note - Safety goggles are required at all times - as with normal paintball Wildwoodz Ltd reserves the right to remove disruptive or irresponsible participants from sessions. Play to our rules or you won't be allowed to continue. All participants will be issued with goggles , coveralls and body armour to make them look and feel the part. We recommend bringing a thin pair of gloves.